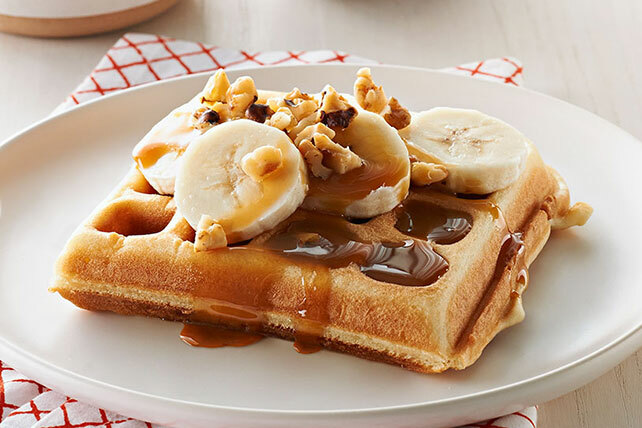 Discover how we thought this Banana Waffle recipe was so tasty, it didn't need syrup. With caramel-nut sauce, this waffle recipe is even more delicious. Prepare waffle batter as directed on package; stir in dry pudding mix. Spray hot waffle iron with cooking spray. Pour batter into waffle iron, using about 1/3 cup for each waffle; cook until golden brown. Meanwhile, microwave caramels and water in small microwaveable bowl on HIGH 1 to 1-1/2 min. or until caramels are completely melted, stirring every 30 sec. Add butter; stir until melted. Slice bananas; spoon over waffles. Top with caramel sauce and nuts. For best results, be sure to use a Belgian waffle mix. Prepare using JELL-O Banana Cream Flavor or Vanilla Flavor Instant Pudding.